This two volume set is a comprehensive guide to neurosurgery. Each section covers neurological disorders in different parts of the body, beginning with an introduction and ending with key practice points for quick review, integrating theory and practice. Genetics, ethics and physiotherapy are also discussed. With contributions from recognised specialists in the USA and Europe, this practical manual includes more than 1000 images and illustrations to assist learning and understanding. 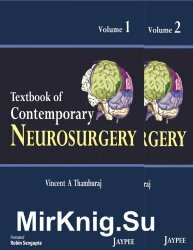 Key Features Comprehensive two volume set giving complete review of field of neurosurgery Covers numerous neurological disorders in different parts of the body Each section feature key practice points for quick review Integrates theory and practice More than 1000 images and illustrations Contributions from US and European specialists.